Right, time for a new project! 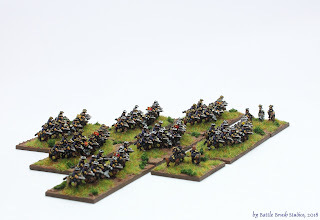 This is the cavalry portion of a Swedish army for the Great Northern War in 6mm. 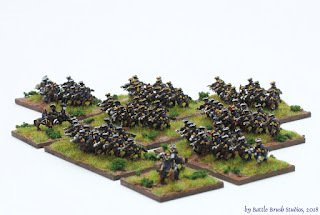 So yeah, starting with Swedish cavalry. The figures are all 6mm Baccus miniatures. As I've learnt from working with their Hoplites and Napoleonics before these are great quality figures. Note how I painted each cornet (little flag) to fit the regiment's colours. We got pretty solid sources on this when it comes to the Swedish army. 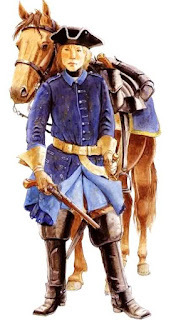 The quota of cavalry in the Swedish army was very high (almost 50%, as opposed to roughly 25% in other European armies). They also reflected the doctrine first introduced by Gustavus Adolphus in the early 17th century. Just as the infantry the cavalry's approach to warfare was very aggressive. At 150m cavalry began the charge with swords drawn. Firing pistols from the saddle and then charge was generally not done in the Swedish army. For this shock tactic Swedes were trained to ride 'knee behind knee', leading to a wedge-like formation in three ranks, leading to a very tight formation which was hard to break up and led to maximum impact. This wedge formation I represented on the bases by arranging the cavalrymen that way, with the officer, musician and colour sergeant in the front. There was a whooooole lot of leading from the front, even right up to high commanders, which really surprised me. Hope you like the chaps! Next: Swedish infantry, cannons and officers.